Alt-right Claire Lehmann is really proud of her boy Bo Winegard, so she keeps promoting his left-bashing work in Quillette. Lehmann is especially solicitous of Winegard's career as we can see when she felt it was her duty to attack me as a " troll" for daring to point out that Bo Winegard is a hack taking wingnut welfare from alt-right promoters of racism like Claire Lehmann. With lots of dittos from her bot-like ditto-heads. But then Lehmann as a member of the alt-right, seems to prefer men who promote "scientific" justifications for racism. But then Christiana Hoff Sommers has been riding the Koch brothers gravy train for decades in exchange for constantly attacking feminism, and no doubt Lehmann would like an easy wingnut welfare-style gig like that for herself. If in fact Quillette isn't already a direct vehicle for right-wing institutional funding, which would not surprise me a bit. Quillette appears to be a way of rebranding the alt-right in order to make it appeal to centrists, and thanks to the assistance of New Atheists like Steven Pinker, Jerry Coyne and Michael Shermer she's been making decent progress. It doesn't hurt that she is an advocate for the religion of New Atheists, evolutionary psychology, making a big to-do over James Damore, who was merely repeating everything that evolutionary psychology, human biodiversity and other hereditarians have been promoting for decades, ever since the Pioneer Fund paid people to come up with data proving the inferiority of blacks. It cannot be pointed out often enough how right-wingers who typically side with corporations against workers suddenly find they no longer approve of "at will" laws like the one Google operates under in California. Funny how that works. Alt-right Claire Lehmann often publishes the work of people who believe in the genetic inferiority of blacks. In addition to Bo Winegard and Ben Winegard, she's published the work of Brian Boutwell, Kevin Beaver, Razib Khan, Richard Haier, Jonathan Anomaly, Jordan Peterson, JC Barnes and probably many others. Alt-right Claire Lehmann is undeniably part of the alt-right: she was a regular on alt-right Rebel Media while running Quillette, which was founded in 2015. Lehmann has appeared on Rebel Media as recently as 6 months ago. Rebel Media has featured the work of, in addition to Ezra Levant its founder, a creepy man with a bizarre love/hate obsession with Justin Trudeau, Gavin McInnes, Milo Yiannopoulos, Michael "pizzagate" Cernovich, Faith Goldy, Pamela Geller, Jack Posobiec and others. And of course Rebel Media adores Trump. Quillette seems to be the perfect alt-right/evo-psycho pipeline to legitimacy thanks to the New Atheists and their fanboys. Here's another example: a piece by Bo Winegard, Ben Winegard and Brian Boutwell titled On the Reality of Race and the Abhorrence of Racism, first published in Quillette, is here republished in American Renaissance - presumably by permission. So Bo Winegard (and his brother and Boutwell) aren't just hacks taking money from Quillette, they are hacks taking money from the unashamedly white supremacist Jared Taylor at American Renaissance. Anybody who denies the connections between Quillette, often endorsed by Steven Pinker, and the alt-right is a liar. 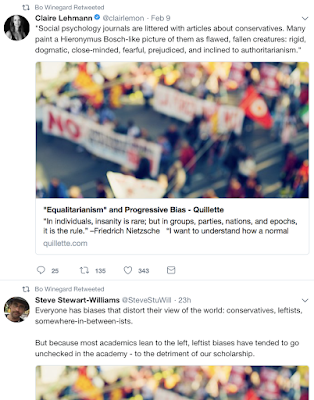 My critique of Quillete and the theories of the evo-psycho bros have been perfectly rational - but because it's something that alt-right Claire Lehmann doesn't want to hear, she called me a troll, blocked me and accused me of bullying and smearing Bo Winegard. And Bo Winegard "just feels sorry for" me. These people have no idea how laughably hypocritical they are.